Born 1984 in Hamburg, he began his studies in Chemistry in 2003. In the summer of 2008 he spent a semester at the Institute of Pharmaceutical Chemistry at the University of Nantes (France). In 2009 he completed his diploma thesis in the group of Prof. Till Opatz at the Institute of Organic Chemistry on the subject: “Auxiliary-Controlled Syntheses of Chiral Derivatives of Pyrrolidine and Piperidine”. 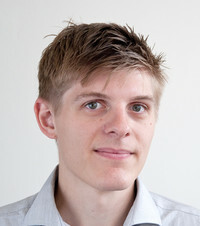 Since 2010 he is a member in the research group of Michael Fröba at the Institute of Inorganic and Applied Chemistry. For his research he makes use of his skills in the synthesis of organic molecules. He assembles them into “metal-organic frameworks”. These porous solids are envisioned to find an application in the separation and storage of various substances.